Cincinnati, OH, USA; Cincinnati Reds center fielder Shin-Soo Choo (17) in the on deck circle during the third inning against the Pittsburgh Pirates at Great American Ball Park. Free agent outfielder Choo Shin-soo of South Korea agreed to a $130 million, seven-year contract with the Texas Rangers, a person familiar with the deal told The Associated Press on Saturday. The person spoke on condition of anonymity because there was no official announcement about the deal that is pending a physical for Choo. That person said the physical is expected to be done before Christmas, and that any formal introduction in Texas likely wouldn’t come until after the holiday on Wednesday. 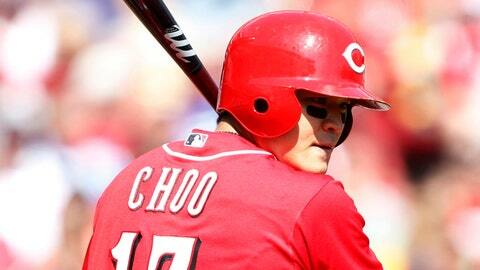 Choo’s deal, worth about $18.6 million per season, is the third highest this offseason. Second baseman Robinson Cano got $240 million over 10 years from Seattle and outfielder Jacoby Ellsbury, like Choo, a client of agent Scott Boras, signed a $153 million, seven-year contract with the New York Yankees. The Rangers missed the playoffs for the first time in four years, with 730 runs scored their fewest in a non-strike season since 1992. Texas, which went to its only two World Series in 2010 and 2011 and lost in the American League’s first wildcard game in 2012, lost at home to Tampa Bay in a wild-card tiebreaker. Choo has a .288 career batting average and .389 OBP with 104 home runs and 427 RBIs in 853 major league games for Seattle (2005-06), Cleveland (2006-12) and Cincinnati. The 31-year-old had at least 20 homers and 20 stolen bases three times, including last season.